The main commercial snappers commercially caught are Malabar blood snapper Lutjanus malabaricus and Crimson snapper L. erythropterus (Badrudin et al, 2005). They are not separated in catch records so are considered here in a multi-species profile for family Lutjanidae (snappers). There is as yet no consensus as to the stock structure of these species, with studies showing between one and seven stocks of L. malabaricus in the region (Blaber et al, 2005; Prisantoso and Badrudin et al, 2010; Badrudin and Aisyah, 2009). This profile may undergo restructuring in the future as new information comes to light. This profile refers to Arafura and Timor Sea (WPP-718) assessment unit. The red snapper fisheries within the regions are fished by thousand of fishers, including many subsistence fishers, meaning collection of data and information has proven to be challenging. The fisheries are targeted by multiple gears, including fish trawls which fish on the same fishing grounds as bottom longline and handlines. The fish trawls are large industrial-scale multi species vessels which transfer their catches directly to carrier vessels, and ship their catch directly overseas, particularly to Thailand and China. The relatively comprehensive information on stock structure, population dynamics, joint catch records of L. malabaricus and L. erythropterus collected through the efforts of the Ministry of Marine Affairs and Fisheries (MMAF) and long-term support from the Australian Government through a joint research between Australia and Indonesia from early 2000 up to now, have provided a basis to develop management plan for the fishing areas of these two species of red snappers. Recommendations on management are available. The MMAF has shown strong intentions of improving the fisheries management by re-licensing and reduce the numbers of fishing vessels and enhancing monitoring of harvesting. Indonesia has developed a road map to develop and implement an ecosystem approach to fisheries management (EAFM). Since 2010, Indonesia has taken steps to develop indicators for the implementation of an EAFM. By 2014, all fisheries management areas will be managed using an EAFM approach, including red snapper fisheries. Indonesia’s Commission for Stock Assessment 2010 report classifies many of the Arafura and Timor Seas fisheries as fully exploited or over exploited. This report proven that the current fishing levels on the snapper stocks in these regions are shown to be unsustainable. Furthermore recent reports showed that illegal unreported and unregulated fishing is still rampant in the Aru, Arafura and Timor Seas. Developing a management solely for red snappers fisheries is likely to be ineffective in the context ofmulti-species and multi-gear demersal fish resources. 1. Promote traceability to ensure that the origin and status of snapper products are well-known and all products are sourced from legal fisheries. 2. Support research to define stock status of Indonesian snapper and improve the availability of accurate data on catches and bycatch. 3. Request that the government improve management and policies encouraging sustainable snapper fisheries and move quickly towards the ecosystem approach to fisheries management for this fishery. 1. Implement a traceability protocol to ensure the origin is well-known and the product was legally harvested by vessels participating in the PT. Ilufa/Intan Seafood Indonesia snapper fishery improvement project. Once the traceability protocol is in place, periodically check the legality and origin of products by checking permits and verifying regions fished during trips, etc. Share the results with the retail/foodservice buyer. 2. You and your supply chain should reach out to fishing companies in Indonesia to join the effort to improve the data reporting through a logbook system that can be used by government to better assess the fish stock. 3. You and your supply chain should reach out to fishery managers in Indonesia and ask that they enforce policies in place to manage the fisheries, and that they develop a clear process to continually evaluate the level of rigor associated with their policy. 4. Be active in assuring that the improvement efforts ongoing in Indonesia are getting the encouragement they need to move forward. Always ask your supply chain about the status of the improvement project efforts. The two main target species of red snappers caught in Aru, Arafura and Timor Seas are identified as Malabar blood snapper (Lutjanus malabaricus), and Scarlet snapper (Lutjanus erythropterus). A stock assessment of these two species was conducted during the joint research on shared stocks of red snappers by Australia and Indonesia in the Arafura and Timor Seas between 1999 and 2003. The objectives of this joint research were first, to describe the population dynamics, stock structure and biology of snappers (primarily L. malabaricus) relevant to the management of stocks shared between Australian and Indonesian fisheries; second, to characterize the social and financial structures of the Indonesian fishery so they could be taken into account in the development of management strategies; and third, to explore ways of developing complementary management for the long term sustainability of the snapper fisheries (Blaber et al., 2005). Stock structure was evaluated by looking at the genetic population structure of these two species in both Australia and Indonesia by allozyme electrophoresis and sequence variation of mitochondria DNA. 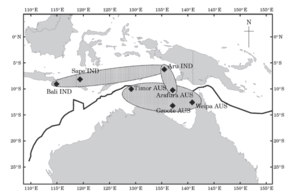 The analysis of the allozyme data on the genetic structures of the 2 species of red snappers (L malabaricus and L erythropterus) from central and eastern Indonesia including Arafura and Timor Seas indicated the existence of 6 discrete populations of L malabaricus, of which 5 of these are stocks in Arafura and Timor Seas (Kupang, Ambon, Tual, Aru and Merauke) (Fig 1). 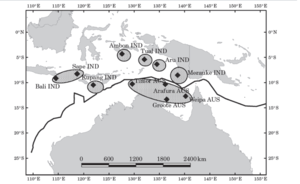 While L. Erythropterus showed genetic homogeneity covering a large area in Arafura and Timor Seas region (Salini et al, 2006)(Fig. 2). Figure 1. Stock structure of L. malabaricus Source: Salini et al., 2006. Figure 2. Stock structures of L. eryptropterus Source: Salini et al., 2006. A more recent study (Prisantoso and Badrudin et al, 2010) indicates that there may be separate stocks in Indonesian and Australian waters. Several workshops to focus on the stock assessment were conducted during the joint research project. Stock assessment of all red snappers was analyzed via a biomass dynamic model for the Arafura Sea, based on Australian and Indonesian catch data collected by the project enumarators, District Fisheries Government, research and survey data on trawls, transhipment data provided by commercial companies, harbourmaster data on landing, observer and biological data. All these data combined with the results of socioeconomic study provide inputs to stock assesssments and management. Recent Indonesian catch data presented a problem and had to be estimated, resulting in the modelling of two possible catch scenarios, and results were considered to be relative rather than absolute estimators of abundance (Blaber et al 2005). The joint research between Australia and Indonesia produced a list of management recommendations on shared snapper fisheries in Arafura and Timor Sea. 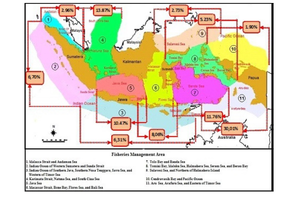 The result of the stock structure analyses led to an assumption that Indonesia and Australia fish the same stocks of L malabaricus and L erythropterus, particularly for fishing grounds along the transboundary areas. Within this context, Australia suggesteda collaborative management plan for the shared stock of red snappers in Indonesian and Australian waters be developed. However, the results of a recent paper presented by Prisantoso and Badrudinet al (2010) that indicated that there are separate stocks in Indonesian and Australia waters were discussed during the workshops on red snappers in 2008 and 2009, and further discussion among two countries is planned to develop possible management options. Table 1: Preliminary list of management options for snapper fisheries in the Timor and Arafura Seas and their potential applicability to each fishery sector of the conceptual model. Fishery sectors are described in Table 1. Y: yes (applicable); N: no (not applicable). Table 2: Advantages and limitations of the potential management options for snapper fisheries in the Timor and Arafura Seas listed in Table 1.Y: yes; N: no. The stock assessment workshop in 2003 determined Maximum Sustainable Yield (MSY) and associated reference points but, given the associated uncertainty in the model, used them only as relative measures. The authors decided to reference the biomass in 1990 as the limit under which the biomass should not be allowed to fall. This biomass level (6,500 tons) was chosen as it represents the year that the biomass was slightly above the biomass at MSY (Blaber et al 2005). To accommodate the lack of information, the joint Indonesian/Australian study examined two catch history options: the pessimistic one assumed a maximum catch in year 2002 of 4,000 tonnes. For the optimistic scenario, the 2002 catch was assumed to be 2,000 tonnes. In both cases, catches for the intervening years were estimated by linear interpolation. In addition to that, due to the data-poor situation, the status of the fishery relative to sustainable yields was investigated. The biomass at 1990 has been chosen as the limit under which the biomass should not be allowed to fall (i.e. the target is that for the fishery to return above the limit, and that may be sustainable in the long term). This year was chosen as it represents the year that the biomass was slightly above the biomass at the Maximum Sustainable Yield (Blaber et al 2005). The report illustrated two options (pessimistic and optimistic) using biomass at 1990 as a reference point. For the pessimistic scenario where the catch in the year 2002 was at its higher estimate, 2002 biomass levels were estimated at 11% of the limit reference point (biomass in 1990). Recovery of the stock would be protracted even under an assumption of zero future catch, with only partial recovery in 2010 to 30% of the limit reference point (Figure 3). Under the more optimistic assumption – the 2002 catch is 2,000 tons – the 2002 biomass is at 31% of limit reference levels. If the future catch is kept at 2002 levels the resource will continue to slowly deteriorate to a 2010 biomass merely 23% of limit reference levels (Figure 4). Figure 3. 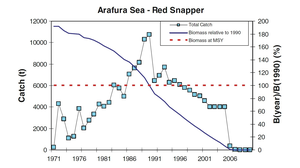 Estimated catch levels (tons) by year since 1971 for the Arafura Sea snapper fisheries, biomass levels as a proportion of 1990 biomass (%) and biomass at Maximum Sustainable Yield (%) under the pessimistic option projecting catches similar to 2002. Figure 4. 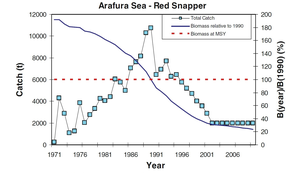 Estimated catch levels (t) by year since 1971 for the Arafura Sea snapper fisheries, biomass levels as a proportion of 1990 biomass (%) and biomass at Maximum Sustainable Yield (%) under the optimistic option projecting catches similar to 2002. Given the potential inaccuracies in the model, the assessment was treated as a relative measure rather than an absolute estimator of abundance. Moreover, due to the paucity of current data and the simple assumptions of the population model, it is clear that the model should be used to investigate policy options rather than for quantitative prediction (Blaber et al 2005). More recently, Indonesia’s Commission for Stock Assessment 2010 report classifies many of the Arafura and Timor Seas fisheries as fully exploited or over exploited (Anon. 2010 in ATSEA 2012). The snapper fishery in Aru, Arafura and Timor Sea is targeted by semi-industrial and industrial operations using bottom longline and fish net/fish trawls. The traditional fishery uses dropline/handline, and bottom longline. The semi industrial bottom longline fishery targets larger fish for export purposes, where most of the vessels originate from Tanjung Balai Karimun in Sumatera, witha sub-base in Kupang, where catches are transported by carrier vessels from Probolinggo (East Java). There have been observed changes in the catch composition of snapper fisheries in the region, based on catch data analysed from 1977 bottom longline and trap vessels from 2005 to 2007. The catch share of Malabar blood snapper declined from 42.1 % (2005) to 30.8 % (2006) and then 24.7% (2007). Another change was in size distribution, using the parameter of length at first capture. Studies show a decline in snapper size structure, for Malabar blood snapper from 50.7 cm and 67.3 cm (2000/2002) to 41cm (2007), and for Scarlet snapper from 59 cm (2000/2002) to 39 cm (2007) (Nuraini and Ernawati 2009). It is likely that the snappers landed were immature and yound broodstocks , compared to the sizes landed during the period of 1999-2002, which was generally longer than 60 cm in total length (Badrudin et al 2004) . These changes in catch composition and size structure can be an indication of unsustainable fishing (table 3). Eastern Timor, Aru and Arafura Seas are the major fishing grounds for red snappers, contributing to more than 30% (35,112 tons in 2007 and 27,012 in 2008) of the total catch in Indonesia (116,994 tons in 2007 115,523 tons in 2009), (MMAF 2009, 2010). Red snappers stated in government statistic data may consists of several species of Lutjanidae. 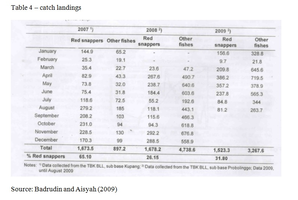 The limited available catch data of snappers (likely L malabaricus and L erythropterus) collected from Tanjung Balai Karimun bottom longline vessels sub-base Kupang (west Timor) and Probolinggo (east Java) was 1,673.5 tons (2007), 1,678.2 tons (2008) and 1,523.3tons (January to August 2009)(table 4) (Badrudin and Aisyah 2009). Information on Catch Per Unit Effort (CPUE) of red snappers in Aru Arafura and Timor Seas is not available. It is likely caused by the paucity of data on the number of vessels, carrier ships and fishing trips. The increase of fuel price in 2007 decreased the number of vessels (bottom longline) operating in Arafura and Timor Seas from 217 to 187. There are currently no management measures applied exclusively to red snapper in Indonesia. Management of snapper (demersal fisheries), as in other fisheries in Indonesia, is mainly by input controls through licensing, implementation of log book system, installment of a vessel monitoring system, and institutional strengthening. Ministerial Decree No 60 of 2001 provides for the arrangement for the utilization of fishing vessels in the Indonesian EEZ while Ministerial Decree No 2 of 2002 established the Guidelines for the Execution of Control in Fishing. It is followed by Ministerial Decree No 3 of 2002 which requires the use of logbooks in monitoring fish catch and transport. Furthermore, Ministerial Decree No 10 of 2003 was issued to regulate licensing and other types of resources utilization in the Indonesian EEZ. Ministerial Decree No 24 of 2003 also established a monitoring, control and surveillance (MCS) system for Indonesia (Agoes 2005). License is granted on the basis of fish stock utilization status, and a new license will not be issued when fish stock is fully or over exploited. Fishing fee is charged on the basis of resource rent. Given that many of Indonesia’s fish stock status is overfished or fully utilized, including in demersal and consumable reef fishes, the central government has reduced the number of vessel licenses it has issued. Contrarily, given new autonomy over natural resource management, provincial and local governments have expanded the granting of fishing licenses (Agoes 2005). More recently, the MMAF has tried to reduce the number of vessels licensed to operate in Indonesian waters. Between 2001 and 2003, centrally-licensed vessels (that is, vessels licensed by the Indonesian central government) operating in four FMAs surrounding Arafura Sea, for example, contracted by 39%, from to 3,658 to 2,629 vessels. Over the same period, however, the number of vessels licensed by district and provincial governments to operate in the Arafura Sea with inboard motors increased by around 105% from 1,093 to 2,238 vessels (MMAF 2005). Therefore, the limitation of numbers of fishing vessels by central government will not be effective without alignment with local governments. There is no recovery plan in place. Trawling in Indonesian waters was banned in 1980 by Presidential Decree No. 39 (1980) , except in the Arafura Sea east of 130o E, which includes the waters of the Kei, Tanimbar and Aru islands. The Fisheries Act No. 45/2009, which replaced Act No. 31/2004, strengthens the effort to eliminate Illegal, Unreported, and Unregulated (IUU) Fishing.Furthermore the Ministry of Marine Affairs and Fisheries issued the Ministerial Decree No. 1/2009 as an amendment to the decree No. 995/KPTS/IK210/29/1999 concerning Fisheries Management Areas (FMA) to support better management of marine and fisheries resources. In 2001 it was estimated that 85% or approximately 7,000 vessels over 50 gross tonnes were operating without a license (Resosudarmo et al. 2009), with the main illegal fishing activities in the Arafura Sea that of trawlers targeting shrimps. In 2003 the government of Indonesia issued a policy to officially license foreign vessels of 100-300 GT through a licensing fee agreement. Illegal fishing practices in the Indonesian Arafura Sea have shown a decline since the implementation of the vessel re-registration policy in 2003 (Wagey et al. 2009). Fegan (2003) indicated that in the Arafura Sea, hundreds of trawlers, most from Thailand, are fishing massive quantities of fish under bilateral agreements. Unfortunately, there is no breakdown of catch by species. It is believed that without a breakdown by species of the trends in catch, scientists can only guess that long-lived slow breeding but valuable species like snapper and groupers are being wiped out in this area. The effects of the red snapper fishery on protected, endangered or threatened species in Indonesia are at present unknown. The main target of bottom longline vessels is red snappers. However, from the report on catch composition, the average catch of red snappers was 40.4% of the total catch. Other catches were deep sea snapper (27.1%), groupers, and other snapper species. The impact of bottom longline on habitat is unknown, but likely low. While the impact of dropline/handline on habitat is likely have no or minimal bottom contact and therefore has little or no affect on fish habitat. There were 88 marine conservation areas (in forms of marine national parks, marine nature recreational parks, marine nature reserves and marine wilderness reserves) in Indonesia in 2011, totaling 13.9 million hectares (Susanto, 2011). There are no management objectives in place. The fishery is managed by input controls but lack of alignment between central and regional management means even this has not been effective. Recent reports show that illegal unreported and unregulated fishing is still rampant in the Aru, Arafura and Timor Seas. According to Indonesia’s Commission for Stock Assessment 2010 Report fishing levels on the snapper stocks in the Arafura and Timor Seas are unsustainable. Scores were determined in 2014 qualitatively based on the limited available information. Catch data from the logbook of FIP vessels of two fishing companies participating in the FIP: PT. Karya Samudera (KS) (data from 2015 to 2018, provisional) and PT. Jala Karya Mandiri (JKM) (data for 2015 and 2016). Total catch for the magament area (WPP - 718) is not represented. FIP rating remains B with last stage 3 and 4 achievements within the last 12 months. PT Intan Seafood and P.T. Permata Marindo Jaya will join FIP during 2016. Improve Traceability on <30GT small vessels fishing inshore Indo waters - a series of activities underway based on the success of tracking 10 vessels (see stage 4), including investigation on how to scale up activities. FIP consultation meeting with the staff of Marine Affairs and Fisheries (MMAF) to discuss 2014 catch data recording. General feedback received from the MMAF to state that data recording has been improved. FIP sent a letter to the MMAF to request a report from the observers onboard durng 2014. To date report has not been received, and another letter is planned to be submitted. FIP participants together with the staff from the Fisheries District Office of Probolinggo and the Head of Sub-directorate of Evaluation of Fishery Resource Management, Directorate of Fishery ResourcesJakarta office reviewed data collection for the logbook. Large scale vessels installed VTS to improve data reporting and traceability. Anin, 2003. Aciar Red Snapper project (FIS/97/165). Report of the final (4th) stock assessment workshop. (Puncak Pass, Cianjur, Indonesia, 18 to 20 March 2003). Draft version. Badrudin and Aisyah. 2009. Separate stocks of red snapper exploitation and management in the Indonesian sector of the Arafura Sea. Journal of Indonesian Fisheries Research. Vol 15(2):81-88. Ministry of Marine and Fisheries Affairs (MMAF), 2010. Capture Fisheries Statistical of Indonesia. Directorate General of Capture Fisheries. Jakarta. p 134.